We receive calls daily from customers with drain clogs. In kitchen drains, the culprit is often someone in the household who put something down the garbage disposal that was not meant to go there. Examples include too many noodles or even stranger things like cigarettes or plants. The bathroom drain clogs can involve a number of obstacles such as hair. Of course there are many reasons why drains clog. Lye: Lye is often the active ingredient in drain clearing solutions. Lye is an extremely toxic substance. Contact with a family member’s eyes or skin is serious and can cause permanent damage. Chemical burns are severe, very painful and leave permanent scars. Don’t use lye to repair or unclog a drain. Chemical explosions: The drain cleaner has the potential to react with substances in your drain and cause an explosion that will send all the corrosive chemical that has been put down the drain back on anyone and anything nearby. Pipe Corrosion: Such substances may clear your drain, but will damage your pipes in the process. Pipes already become weak and brittle over time through the natural corrosion process. When treated with drain cleaners, this process is accelerated. An innocent clearing of a drain can cause leaks costing hundreds or thousands of dollars. 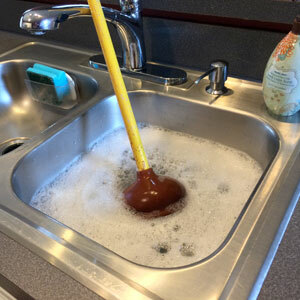 Have a question about a clogged drain issue in your home? Ask a plumber the best way to fix a drain clog and you will receive a number of different answers, with no consensus. Many different opinions exist regarding the best way to repair clogs. A home’s plumbing system is one of the most vital elements for clean water and functionality. We recommend you don’t experiment with your pipes. Instead trust your plumbing fixes to a professional. Morton Plumbing, Heating & Cooling is the best choice for quick, safe, and efficient drain clog removal service. Our plumbers have the knowledge and experience to solve your plumbing problem, whether it is a clogged drain or any other issue. We care about our customers and our services are priced to fit any budget. We’ll bring peace to your pipes!